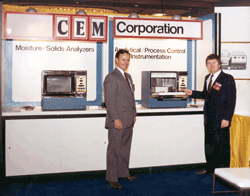 CEM was founded in 1978 by a Chemist, an Electrical engineer, and a Mechanical engineer, hence the name CEM. This small operation began in a rented unit in a strip mall across the street from the present location of CEM. The company was started around the initial product which was a microwave based moisture analyzer. As the engineers designed, built, and tested the instruments, the chemist ran samples, designed methods, and demonstrated the equipment to potential customers. This microwave based system allowed customers in the food industry to rapidly detect the amount of moisture present in different samples, which is an important part of QC, and the dramatically reduced test times were a huge advantage to the industry. As this product began to have success, more products were designed at first largely directed to the food industry. Another early product allowed rapid and accurate fat testing, which also was a major enhancement over the way fat testing was done at that time. As CEM systems were becoming more accepted in the food industry, the company became aware of another major opportunity in the environmental market where microwave energy could be applied, which led to the formation of the Analytical Division. The initial product was a microwave digestion system that would digest soil and wastewater samples among other materials in preparation for metal analysis so that these materials can be examined for their trace metal content. This also opened the door for opportunities for doing microwave enhanced extraction. With these two areas of focus, CEM grew over the next few years to about a $15M company. In 1987, the Electrical Engineer and Chemist (the Mechanical Engineer had retired) decided to take the company public to help generate additional capital to grow the business. And from 1987 until 2000, the company was a publicly traded company on the US stock market. In 1990, the company also began to expand rapidly into international markets and found it necessary to establish several subsidiaries. 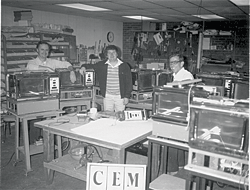 From 1990-1991, CEM established offices in the UK, Germany, and Italy. In addition, CEM got deeply involved in other international markets and established long term relationships with key dealers around the world, many of whom still work with CEM today. (In 2002, this led to another subsidiary being formed in France). In 2000, the Chemist, who was the last of the 3 founders still involved in the company, decided to take the company private by buying it. This would allow CEM to control its own destiny and do what he thought best for the long term success of the company versus being beholden to the whims of the market. This in turn allowed CEM to establish the Synthesis and Bioscience divisions over the course of the next few years, to expand into new areas. And today CEM continues to reinvent itself, constantly looking for new product opportunities in all of the areas in which we operate. CEM is balanced between all four divisions with new projects underway in each area which is reflected by continued growth in each area. In addition we are carefully looking at new areas in which we can make a difference. CEM’s core competency has expanded from solely microwave hardware design to having talented, creative Science and Technology groups that can investigate many different opportunities and identify the opportunities worth pursuing then quickly pursue them. Our uniqueness lies in our familiarity with the many different markets in which we operate, our ability to quickly and effectively design novel products for these markets, and our ability to bring these products to customers in every part of the world with the highest level of customer support. In fact, whether you know it or not, you most likely eat food that has been tested in CEM equipment, live in an area where your soil and water have been tested for contaminates by a CEM product, own consumer products that have been tested for multiple different things in a CEM product, use different novel materials (in your car or electronic devices) that have been researched using a CEM product, take medication from a pharmaceutical company that uses CEM products to more efficiently design new medication, and your quality of life will most likely be positively impacted by the research currently underway in CEM products.